Woody's Farm names 2013 'heroes' of the year. Firstly I want to apologise for being so late with this (last) weeks blog. I want to try and post every Friday but last week we had a family occasion in New Plymouth and I didn't get time. Not too worry, here we go.... -------------------------------------- When Claire and I moved to Manakau we already knew some pig farmers nearby. Leanne and Darren run Kapiti Free Range with their son Reuben, their farm is in Te Horo just 10 mins south of us. After the six month long search for the farm was over I decided to give Leanne a call to tell her that we had found a farm and even better we were going to be neighbours. Leanne had told me months ago that she simply couldn't meet the demand for free range pork so I decided to ask if we would be able to work together, however life has a habit of throwing a curve ball and personal matters had become a priority for Leanne and they had made the very hard decision to sell their herd and stop farming altogether. This was initially a real disappointment and shock for me but Leanne and Darren were keen to help me set up and start the business and along with Reuben they have become excellent mentors. On Saturday 23rd November Leanne invited us to meet her at Hill Street Farmers market in Wellington. This was a great opportunity to see how the farmers market works, to meet the customers and to experience my future. 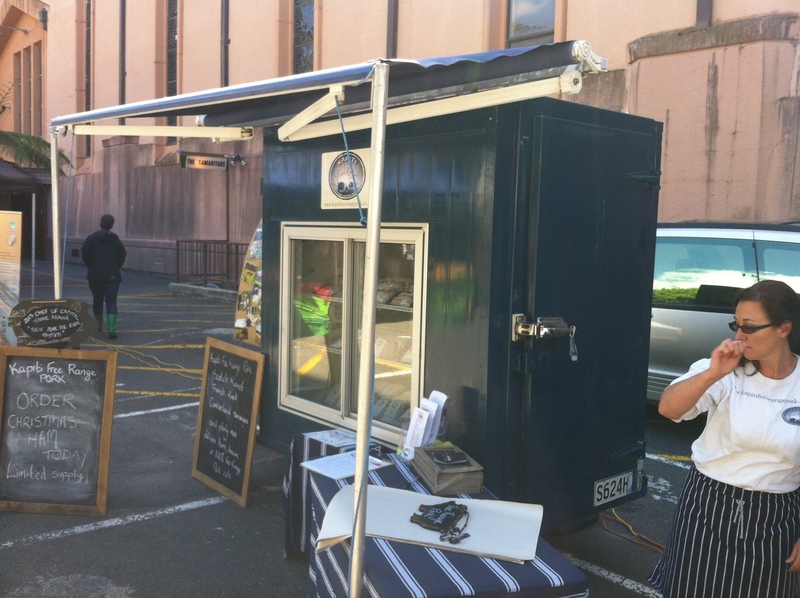 [caption id="attachment_187" align="aligncenter" width="890"] Leanne and the Kapiti Free Range refrigerated stall at Hill Street Market. [/caption] I spent a good few hours watching the market stalls and seeing how Leanne worked the customers. She has an excellent rapport with her regulars and it was great to get to meet a few. People at the farmers market are there because they care about what they eat, they want to talk about it and a good few were excited to here that I was setting up a pig farm near Leanne. The sales part of my new life really excites me and I simply cant wait to get the pigs up and running so that I can start to market the pork, bacon, sausages and everything else. Marketing and sales is what I do and at least this part of being a farmer is not completely new to me so I already have a few innovative ideas about our Woody's Farm brand, the logo and how to market the different breeds that I will be raising. Part of this will be the 'Pig Day Out' experience where customers will be able to come and see the farm and really understand what goes into breeding pigs. Its really important to me that everyone becomes an integral part of the food chain and I am hoping to help that by showing people where their food is really coming from. So for now keep an eye out for Kapiti Free Range and I look forward to seeing you at a Farmers Market in March 2014.